Sacha knew something was wrong with her - but the doctors didn't. 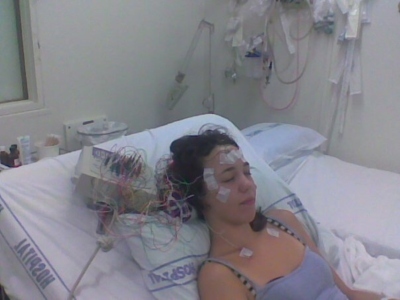 On my 17th birthday I had my first mini stroke, I had a tingly feeling down my right side and my face felt funny. I didn’t know what it was but it just didn’t feel right. I kept having these ‘migraines’ over and over again. Each time I went to Auckland hospital and they did tests and kept telling me that I was having migraines. I had over 30 MRIs, 3 lumbar punctures, CTs, tests galore. I had another stroke at school, in the corridor. I completely lost the feeling down my right side and fell to the floor, the numbness didn’t leave me and I knew now that I wasn’t just having migraines. I went to the hospital and they finally said I was having mini strokes but they didn’t know why. I had 19 mini strokes over nine months, leaving me with a numb right side, completely lost my short term memory. The last stroke left me in a coma for 12 hours. I was in ICU, with my grandpa at the end of the bed praying for me, the doctors said they couldn’t do anything. The doctors finally figured out that I had a tear in my artery in my brain and I had brain surgery in March 2009. They went up through my groin to my brain to shut off the artery. I was young and a mystery, I was brave and still am. I had my grandpa, my main supporter by my side. Taking me to all my appointments at the Stroke Foundation, Laura Ferguson. I learnt how to walk again, how to talk, write, everything. I had to write everything down so I would remember it. I had to learn how to speak, it’s like my brain’s ‘short term memory’ had been wiped and I had to start from the beginning. It was hard but I like a challenge, the thing that was the hardest for me was that I looked normal. Yes it’s a positive but when your brain has been through so much trauma, I wanted to look different so people would know. I didn’t give up or stop trying, I kept studying and improving. I did a culinary course, Makeup artistry diploma, freelance Makeup work and years of Sales and now Marketing. It’s been 10 years since I had my strokes, I have had 10 years of challenges, of growth and triumph. I am now a normal person walking around, living a normal life. And I owe this to my grandpa, friends, and all the people who told me I could do it. Life’s a challenge if you let it, bad stuff happens to you and you can either run away from it or try and fix it. I can happily say I’m a stroke survivor and every day is a blessing.